Denice Santiago, 46, is the third daughter in a family of five and grew up on the periphery of Salvador. She joined the Police Force (PF) at the age of 18 in 1990, when the first group of women joined the PF of the Brazilian state of Bahia. Santiago became one of the pioneers on the force, which is now 13.7 percent women. Pioneering is one of the words that moves the major. She started an anti-racism training program at the PF. 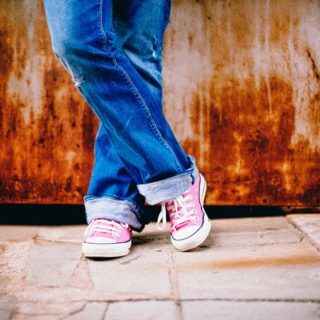 “I have a 16-year-old black boy, I have a social commitment and a personal anxiety about this,” she says. Another important priority is to combat violence against women, and this has become Santiago’s signature issue. In 2006, she was responsible for the creation of the Maria Felipa Center, a group of women from the police force dealing with female police officers’ working conditions. 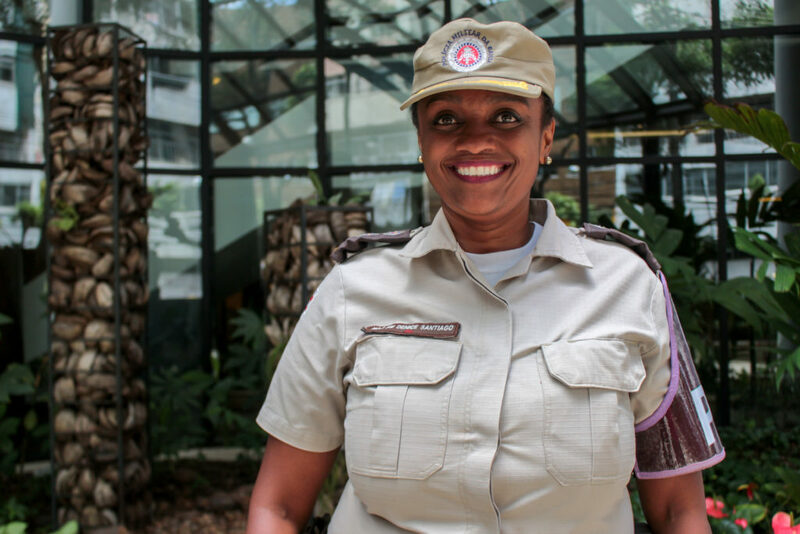 Right after, she started working at the State Department of Public Policies for Women and created Ronda Maria da Penha (Maria da Penha Patrol), a project of the Police Force of Bahia, which was inspired by a 2012 Rio Grande do Sul experiment safeguarding women under orders of protection. The name of the program honors a pharmacist born in Ceará, a victim of domestic violence, who successfully fought for her abuser’s conviction. A law imposing tighter penalties for domestic crimes against women bears her name. Santiago has a degree in psychology and is now the commander of the Patrol. She uses her understanding of the human psyche to run the police operation. In March 2017, the Federal Senate awarded the major the Bertha Lutz Commendation, given to women who stand out in the fight for women’s rights. 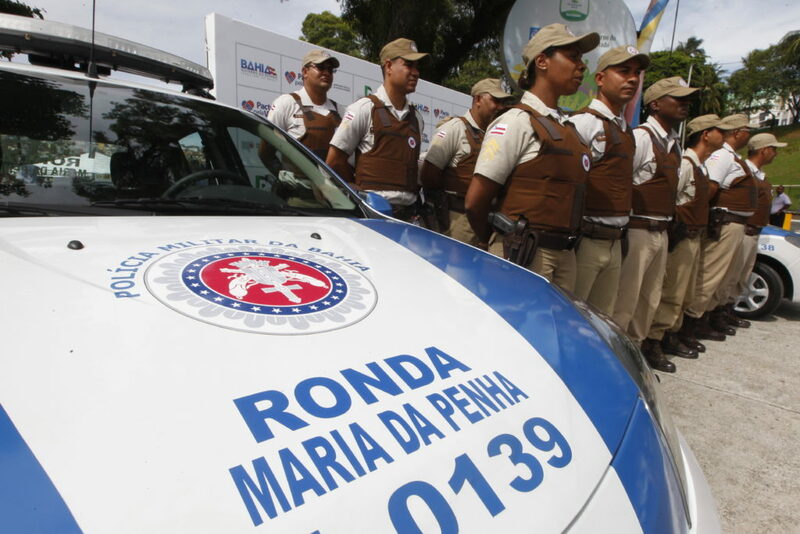 In the same year, Ronda Maria da Penha received the Brazilian Public Security Forum’s Seal of Innovative Practices in Combating Violence against Women, with the Ronda para Homens (Patrol for Men) project. “I noticed that some men were already on their third or fourth abusive relationships,” says Santiago. “So, I set up this project in which two police officers talk to the abusers about violence in workshops with videos and games.” In 2018, the major will fly to London to teach authorities how to replicate the project there. “I like the police force, I’m part of it, so I help create things,” she says in an interview to Believe.Earth. Believe.Earth (BE) – Why are women still a minority in the military? Denice Santiago (DS) – I understand that militarism is historically and culturally a masculinized structure, in which society has learned to accept as the embodiment of maleness and of masculine strength. In Bahia, we have been proving that it is not true, and for almost 28 years. Other states, such as São Paulo, have been doing so for more than 50 years. In Bahia, we are the first majors, we are still learning and teaching what it is to be a female major. We have not yet reached all positions in the force, we will still have more pioneers in other positions and environments. BE – What has changed since you joined the PF? BE – How did the Maria Felipa Center come about? 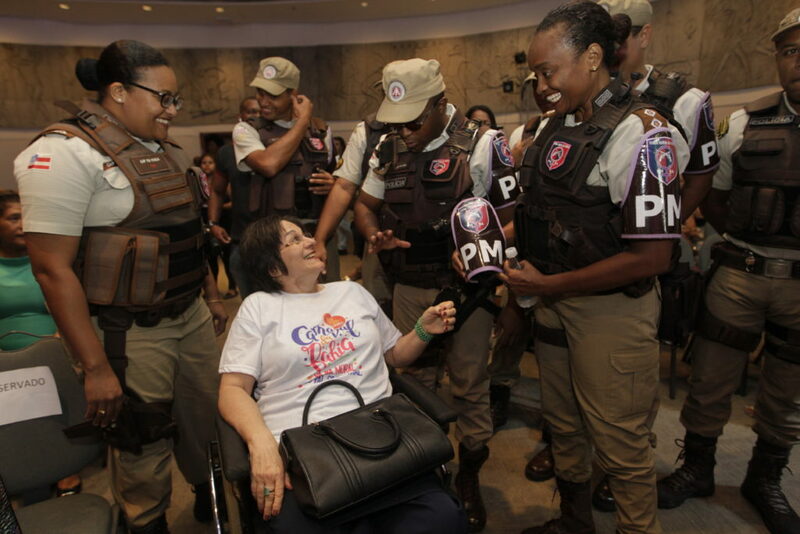 DS – In 2005, during the celebration of the 50th anniversary of women’s entry into the Police Force in São Paulo, several women took the stage to report suicide attempts and suicides of their children, linking those issues to their jobs. When I went back to my office, I asked the commander-in-chief at that time, Colonel Santana, to create a center for policewomen dealing with female issues. The initiative was launched in March 2006, welcoming and listening to the policewomen and assisting the command of the force on related legislation, and other matters, ranging from uniforms and issues of moral and sexual harassment to domestic violence. Police officers began to come to the center to find out how to protect themselves, and, their wives also came to us. We have created a decree protecting pregnant officers, in which they leave operational duty and work in administrative positions until the end of the breastfeeding period. After that period, they come back to duty gradually with no loss of status or pay. BE – And, why did they choose the name Maria Felipa? DS – My initial suggestion was Maria Quitéria [in reference to the first-ever Brazilian policewoman, who pretended to be a man in order to get the job]. When I brought the idea to the colonel, he said, “Do you want to dress like a man to be accepted? Find out about one like you, Maria Felipa, and see if it’s not a better name for your project.” We started studying Maria Felipa’s story. She was a freed slave who gathered other women to fight for the independence of Bahia. That was exactly what we wanted, to bring women together to fight for what we believe. BE – How did you begin fighting for women’s rights? DS – Working with the Maria Felipa Center has taught us a lot about domestic violence and brought discussion of the issue to the PF. We began to promote courses and meetings so that the police force began to better understand a double relation: A policeman who could be an abuser and at the same time, the man from the force who would attend the female victim of violence. This policeman needs to know the law, Maria da Penha’s Law, as an officer, but as a man he also needs to know the kinds of violence he may be committing. This work brought me closer to the issue and, after six years at Maria Felipa, I was invited to work at the State Department of Public Policies for Women (SPM). I worked in the face of violence but also with support for my autonomy. Much of what I know is due to that period of my life. It was at SPM that I started thinking about Ronda Maria da Penha. BE – What is daily life like on Ronda Maria da Penha? DS – Ronda’s mission is to protect women victims of domestic violence who have emergency measures orders of protection. We visit these women, going to their homes and workplaces. We also visit their neighborhoods. Whenever possible, we talk to the abuser. Ronda accompanies the woman to court so that she doesn’t feel frightened and think of giving up on prosecuting her abuser. We have three squads, each consisting of a woman and two men who make visits where they evaluate risks. When the problem comes to us, the police officers visit the victim and have her fill out a questionnaire, they then draw a psychosocial profile and evaluate the risk. If it is imminent, we visit the woman daily, sometimes more than once a day. BE – What is the most complex part of this work? DS – I understand that arresting the abuser is easy. But, how can I prevent this man from assaulting his next companion? How do I stop this woman from going through an abusive relationship again? We must educate and sensitize people, and prevent this. Ronda has set up a Governance Committee, which includes the Court of Justice, the Public Prosecutor’s Office, the Public Defender’s Office, the Secretariat of Policies for Women, all the bodies of the Public Security Secretariat are involved, and, we meet every two months to discuss strategies for action. I brought police officers with degrees in law, psychology and social service to work here and help create projects. One of these projects is Women of Courage, which offers classes at Ronda’s headquarters about empowerment, entrepreneurship, arts, theater, dance, as well as group therapy. BE – What are the gains so far? DS – Since we started, under our protection, no woman has ever suffered any further assault. We have attended 1,733 women. Most of the time, they need someone to listen to them without judging them. Society tends to judge, they wonder what this woman did to be spanked. We cannot forget that in an assault, the abuser is the guilty party. There has also been an increase in complaints and I will credit it to Ronda. Women feel more confident in reporting issues. In the beginning, a protective order was just a piece of paper. Now, Ronda is present from the moment the order is issued. BE – How can we build a more equal society? DS – I believe in a Police Force that looks at human beings as they are. A Force that doesn’t care about religion, skin color, or social position. That welcomes, respects, fights, but mainly prevents problems from occurring. Crime is a result of something that has escaped our control, but I want a Police Force that is concerned with protecting, saving lives, growing with society, getting close to it, listening to it and respecting it. 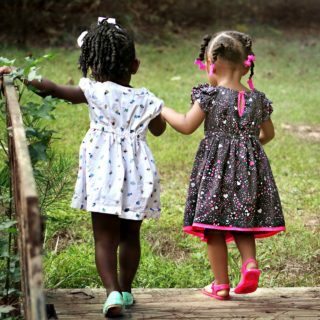 Besides that, we must understand the other women who, as much as we do, need care, caring, and welcoming. I strive to respect people, the women we serve. I practice Candomblé [an Afro-Brazilian religion] and Iansan is the one who guides me, she is an Orisha [goddess] who cares and looks after people. Iansan’s rays and storms protect those she looks after. As Iansan’s daughter, I do my best to protect people, too.